Return to IHSGB main website. Here you can see the profile of some of IHSGB's young sports riders who have ambitions to represent IHSGB. Sandy is 17 and is an aspiring young sports rider. 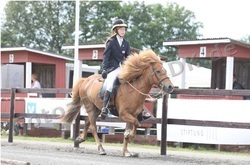 Sandy started competing on Icelandic horses when 11 and has successfully held the title of IHSGB Youth Tolt and 4 gait Champion on several occasions. Sandy first represented GB Internationally in 2010 when he was selected to ride at FEIF Youth Cup in Denmark. 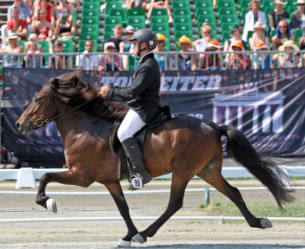 In 2011, Sandy achieved C+ squad with BYRDS on his Icelandic horse and continues to enjoy training and competing in dressage. In the summer of 2011, Sandy spent some time in Germany training along with Robyn before participating in the German Youth Championships - which was a wonderful learning experience. Sandy went on to be part of the IHSGB Youth Team at FEIF youth Cup in 2012 and participate in the MEM 2012 with the senior GB team. In 2013, Sandy took his seat as a young rider on the GBR team at the World Championships in Berlin. This was a great achievement and the beginning of ambitions becoming reality. In equestrian sport, Sandy's ambitions are to continue to develop as a young rider and hopefully represent GB at the World Championships as a young rider / adult for Icelandic horses. Aidan is 14 years old and one of the younger generation of young sports riders starting to make an impression in competition. In 2011, Aidan was awarded the Youth Feather Award at the British Championships. He attended the FEIF Youth Camp in 2011 - making many new friends from around the FEIF nations. Aidan holds the Youth title in Britain for Tolt and Four gait in both 2012 and 2013. Aidan enjoys all things competitive and has ambitions to further develop his riding skills and would like to be able to compete in FEIF Youth Cup next time around! Cory is the youngest rider on the page at just 11. He has so far competed in several Icelandic sport competitions and had his oval track debut at 9! Cory was 2nd in 2013 in the youth tolt at British Championships and 3rd in youth 4 gait....with lots of ambition...this young man is one watch! Shannon is 17 years old and was first introduced to the Icelandic horse in September 2010 and got hooked! "I help out at Halfkey Icelandics, where I help train young horses and exercise the older ones, We have 6 at the moment 2 yearlings 2 oldies, and 2 youngsters that we are training." Shannon enjoys hacking out and learning new things and would like to progress with the oval track competing, after a very positive start to her oval track experiences with different horses. Shannon would also like to meet more youth riders in the IHSGB and share their experiences! 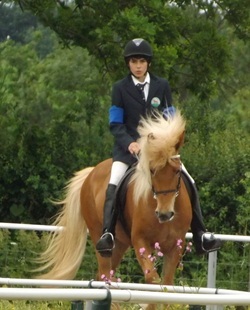 Robyn is 16 in 2012 and is an aspiring young sports rider. Robyn has been riding for as long as she can remember and riding Icelandic horses for 4 years now. Robyn first represented GB Internationally in 2010 when she was selected to ride at FEIF Youth Cup in Denmark. Robyn is currently successfully competing in four and five gait and T2. In 2010, Robyn was intermediate champion in four gait and T4. Robyn competes in cross country and has been placed 2nd last year, she enjoys jumping practise, which she hopes prevents the horses from getting bored! In the summer of 2011, Robyn spent some time in Germany training along with Sandy before participating in the German Youth Championships - which was a wonderful learning experience. In equestrian sport, Robyn's ambitions are to continue to develop as a young rider and hopefully represent GB at the World Championships as a young rider / adult for Icelandic horses. 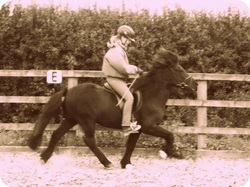 Ellie will be 16 in 2012 and although relatively new to riding, is developing a great bond with Icelandic horses. 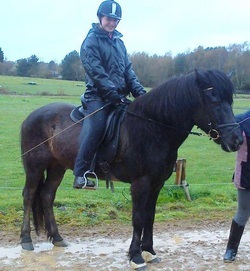 Ellie began riding 3 years ago and was introduced to the sport by an Icelandic horse. She has competed in Beginners Tolt and T2 and come 1st in beginner tolt and 4th in T2 in 2011. 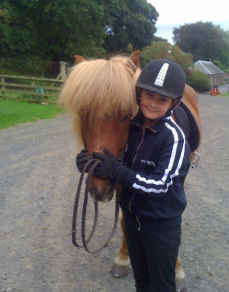 Ellie enjoys hacking and is having fun working with Huni and improving their skills together. She would like to further develop her riding skills and has ambitions to move up in oval track competition. Note: If you wish to have your profile on this page - please contact Kirsty for details. Parental permission must be given for your profile to appear.